Macoupin County Courthouse Hours of Operation 8:30 A.M. - 4:30 P.M.
Each year natural hazards (i.e., severe thunderstorms, tornadoes, severe winter storms, flooding, etc.) cause damage to property and threaten the lives and health of the residents of Macoupin County. Since 1982, Macoupin County has had five federally-declared disasters. In the last 10 years alone (2008 – 2017), there have been 59 thunderstorms with damaging winds, 40 severe storms with hail 1 inch in diameter or greater, 20 excessive heat events, 15 flash floods, 14 severe winter storms, 8 tornadoes, 4 mine subsidence events, 2 extreme cold events, 1 drought, 1 dam failure and 1 earthquake felt by residents in the County. While natural hazards cannot be avoided, their impacts can be reduced through effective hazard mitigation planning. This prevention-related concept of emergency management often receives the least amount of attention, yet it is one of the most important steps in creating a hazardresistant community. County News: May 20, 2016 – Most townships have not had their precinct lines changed since 1976 when the County’s precinct lines were initially drawn. Things have changed in the last forty years and it seems like time some of these precinct lines change as well. The County Board is considering changing precinct lines in some townships. The current proposal, developed by County Clerk Pete Duncan, would lower the number of precincts in the County from 61 total to 50. - Brighton Township would go from 3 precincts currently to 4. - Cahokia Township would go from 5 precincts currently to 3. - Carlinville Township would go from 6 precincts currently to 5. - Gillespie Township would go from 6 precincts currently to 3. - Mt. Olive Township would go from 6 precincts currently to 3. - Nilwood Township would go from 2 precincts currently to 1. - Shipman Township would go from 3 precincts currently to 1. – More fair to voters. Currently, there are major discrepancies in how many voters are in each precinct. Right now, Brighton 3 has 1,413 voters total in the precinct. Carlinville 4 however only has 162. It isn’t fair to voters in Brighton 3 to potentially have 1,412 other voters that need to vote at the precinct while Carlinville 4 voters only have 161 other voters to deal with. This proposal will help equal out those discrepancies. – More efficient for everyone. Each precinct is entitled to 5 Election judges to work the polls. There would be 305 judges working on Election Day if every precinct had all five spots filled. It has been nearly a decade since Macoupin even came close to having 305 judges working. By consolidating precincts, the number of judges decreases considerably meaning it will be easier to have every precinct fully staffed and meaning it will take less time for everyone to vote, ballots to be counted and results to be released. – More cost effective for taxpayers. The cost of each precinct is about $1,000. By consolidating precincts to make things more fair for voters and more efficient for everyone, voting will also become more cost effective for taxpayers. This proposal will save $11,000 for each Election. This proposal will also help cut down future costs by allowing the tabulators used to count ballots that are no longer going out to a precinct to be kept as backups for machines that may break or need replacing. Instead of having to spent a significant amount of money buying even a refurbished machine, Macoupin can now just use our backups. The County Board will be voting on this proposal at the June 14th Board meeting. They are currently looking for comments from voters. Anyone interested can visit www.macoupinvotes.com and click ‘Precinct Boundary Proposed Changes Information’ for more information and maps of the current precincts as well the proposed precincts. 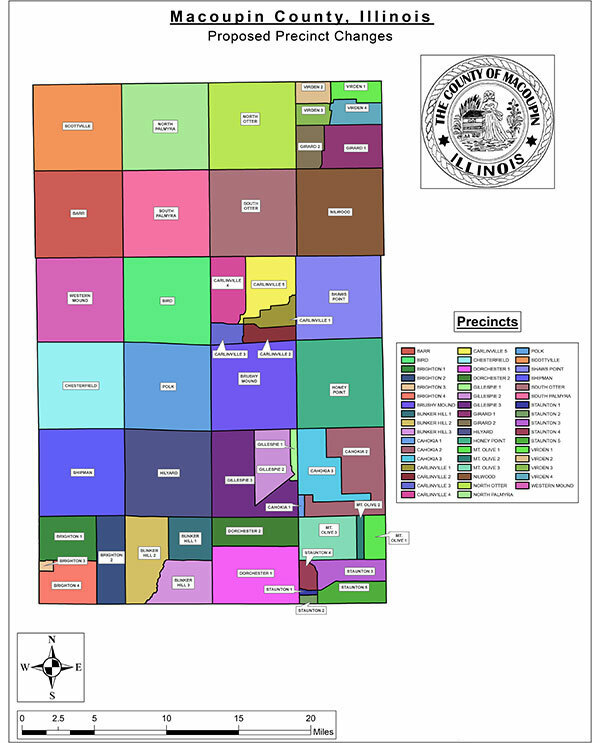 Anyone wishing to leave a comment for the Board, email elections@macoupincountyil.gov or call (217) 854-3214 ext 708. County News: April 30, 2016 – Searching Macoupin’s recorded documents has just gotten a whole lot easier. While in the past, a search for a recorded document would have required a trip to the Recorder’s office and a laborious search through the over a thousand books holding those documents, County Clerk and Recorder Pete Duncan recently launched an online index book portal which will allow anyone to access millions of recorded documents 24/7 from their home. The Online Index Book Portal was a year long project that now allows all of the index books and document books from the County’s founding in 1829 to 2000 to be searched online. Combined with the existing online access to the Recorder’s office from 2001 to the present, all recorded documents are now available to be searched, viewed and printed from one’s own computer. The online index book portal can be viewed at the following link: http://macoupincountyil.gov/county_clerk_remote.htm. There will also be an open house where anyone interested can attend and see a demonstration of how the portal works and what benefits it can provide. The open house will be held on Thursday, May 19th from 1:30 to 3:00 p.m. in the County Board room on the second floor of the jail complex. The Ben-Gil Boosters is a community-based organization comprised of parents and educators dedicated to rebuilding an elementary school for the children of CUSD #7. Learn more by visiting the Ben-Gil Boosters Website. Volunteer Macoupin!